Ordinary Goodness: Different sorts of fire. 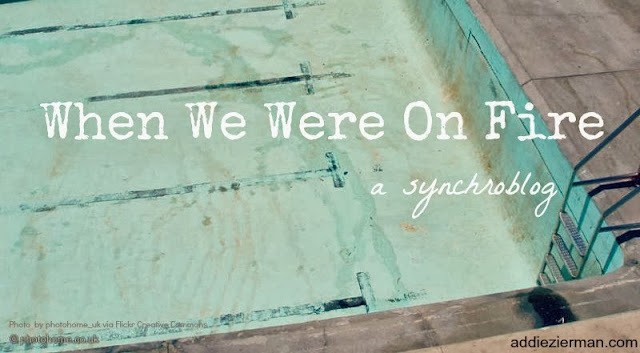 I wrote this piece for Addie Zierman's synchroblog. Her memoir, When We Were On Fire, came out on Tuesday. Check out the many great stories there! The first time I went to church camp, the altar calls seemed mystical to me. Actually, the whole late night chapel experience struck me as a new world, not one that I had seen during my traditional United Methodist upbringing. I was 12, and I loved the smell of the wooden pews, the sounds of the cicadas outside the open windows and the humid air being broken by the nearby creek. I loved the simplicity of the falling darkness, no bright lights, faces dim in the shadows. I loved the singing, tunes I knew from my first years in youth group, and others I learned through five days of hearing them over and over. Shine, Jesus, shine, fill this land with the Father's glory... Will you come and follow me if I but call your name? But yeah, the altar calls. They mesmerized me because I had never seen people this close to my age do something like this, kneel and raise their hands and sometimes cry. They mesmerized me because there was no rationality, it was all fiery emotion, all heart that seemingly pushed them up front, it was clear that whatever it was, they felt it. And they mesmerized me because I didn't feel it, didn't know if Jesus would meet me up there if I went, didn't know if I liked the whole lying-prostrate-before-the-Lord thing anyway - at least not in front of all these people. It was, I think, the first big time where I felt like I was supposed to feel something that I simply didn't feel, and that not feeling it took away from my identity somehow. I hadn't encountered this before. After all, church was my favorite place to be. Why wasn't I on fire like they were? And why - except perhaps for that desire to fit in - did I prefer to stay out of the flames? Apart from that curiosity, my first two years at camp were wonderful. I frolicked in the creek, learned the dances to "Bye Bye Bye" and "It's Gonna Be Me," wrote letters (the idea of receiving snail mail back was intoxicating), hiked, listened to late night ghost stories and bonded with my fellow campers and our counselors, fun-loving college students who listened and laughed with us. We all exchanged email addresses and said our goodbyes, and for many weeks, months and (in some cases) years, we corresponded on a regular basis. One drizzly cold Saturday in January, with George W. Bush's first inauguration speech droning on the radio, my sainted mother drove me all the way to the Mall of Georgia to eat Chick-fil-A with two girls from my group. The third summer was the year I made the switch from middle school camper to high school camper. On the surface it really wasn't much different. We still had the same schedule and sang the same songs. But for some reason - maybe demographics had changed, or maybe I was suddenly old enough to think a little bit deeper - it felt like a lot had shifted. My group that year talked a lot about getting into heaven, a lot about getting saved, about hell. John 14:6 was batted around often, I am the Way, the Truth and the Life, no one comes to the Father but through me... My counselors and most of the campers had apparently crossed over to the other side, they had asked Jesus into their hearts to be their Savior. They didn't seem to have any questions about anything. Meanwhile, I thought of all my friends from school, Muslims, Jews, kids who didn't go to church, and how good and dear they were. I thought about my own church community, open, loving, letting me ask questions. I thought that God must have had a reason for creating human beings of so many different threads, with the same sacredness and beauty sewn through all of us. Some of this I said out loud, trying to stand up for my friends and my 14-year-old self in the ways of the cosmos. But there wasn't much getting around the boundary that my counselors and camper peers had already set, their stars aligned in a cross and thorny crown that I couldn't seem to bypass. And I started to believe that maybe I was wrong. It's a weird feeling to go to church all your life, to adore youth group with all your heart, to sing hymns to yourself when you're stressed, and then encounter people who don't think you have the right kind of fire, the right kind of faith. Especially within a quick five days, only two months before high school begins. It's downright unnerving. On the last night of camp, I finally went to the altar. I finally cried. But I did it because I felt like I was supposed to, and the tears came because I didn't know how to find a way out of my confusion. Any fire that burned in me was pure frustration. Maybe they didn't think I was a Christian. But I couldn't stop believing that my non-Christian friends were going to heaven. I couldn't stop believing that my path was mine, but that God had given others their own holy winding roads. And I couldn't stop the people surrounding me from believing that I was wrong to think this. I came home the next night. Home. It felt so good, so safe for questions. My mother sat in my room for over an hour while I ranted and worried and wondered about the many God-thoughts roiling inside of me. Mom told me it was okay to feel all of these ways. In my heart, I knew that was what God would tell me, too. Perhaps the folks from that summer would be pleased to know that my third year at camp - my final year at camp - was the one that ultimately shaped my faith more than any other. Or perhaps they wouldn't be. Because in the last eleven years, many vessels - people, experiences, my own soul - have given me the hope and courage to let my vision of an open-hearted Christ and an all-loving God grow deeper. After the narrow ways of those five days, my flames of frustration burned out and created something new. My fire was rekindled by the mystery, the fullness, the immense possibility of God, in us and around us. Sometimes the flames reach high. Sometimes I'm running on embers. And so I try as best I can to embrace the middle ground, those moments when even the smallest sparks light up the darkness, when trust slips in unnoticed and grabs my hand. When I approach the altar in my heart - the altar that matters most to me - and whisper thank you for your warmth. Thanks, Claire! I have been on those benches too. Thanks for naming this feeling: "It was, I think, the first big time where I felt like I was supposed to feel something that I simply didn't feel, and that not feeling it took away from my identity somehow. I hadn't encountered this before. After all, church was my favorite place to be. Why wasn't I on fire like they were? And why - except perhaps for that desire to fit in - did I prefer to stay out of the flames?" This is a beautiful story - full of the many graces of God, and the way He shapes our stories, and uses all of it - all of it - without waste. Thanks for sharing. Love the way you came to encounter the mystery of God...and that this is what ultimately shaped you. And your wonderful mom, who sat with you and let you rage and question. I hope I can be that for my kids. Thank you so much for linking up Claire. Loved this.